"With all my deep bite patients I normally needed to perform time consuming advance preparatory tooth movements to create room for the bonding of the lower incisors. If only that incisal bracket wing was smaller, there would be less chance of the patient biting off the brackets. 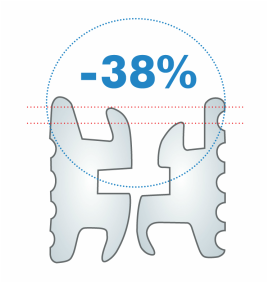 I contacted Claus Schendell from adenta with my idea...We were able to reduce the incisal bracket wing by 38%, and still maintain function and control of treatment. This simple solution enabled me to bond the lower incisors early in treatment, reducing treatment delays, extra steps and treatment time".